Simon has made the difficult decision to appeal the “bogus” ruling brought against him by the British Chiropractic Association (BCA). News of the launch of a campaign in support of free speech appears below in an extract from an email sent from Simon. I am glad to say that on Monday I will apply to the Court of Appeal in an attempt to overturn the recent negative ruling on meaning in my libel case with the British Chiropractic Association. Also, Sense About Science have launched a campaign linked to my libel case and focussing on the need to overhaul the English libel system, which is deeply flawed and which therefore has a chilling effect on journalism. The campaign has issued a statement of support, which has already been signed by an incredible list of people, including James Randi, Richard Dawkins, Ricky Gervais, Sir Martin Rees, Penn & Teller, Stephen Fry, Martin Amis and Steve Jones. It would be terrific if you would also sign up to the statement and (better still) encourage others to sign up. It is conceivable that this campaign could help reform the English libel laws (which unfortunately affect overseas journalists too). Please help us move closer to having a free press. The statement now has over 4000 signatories and is gathering speed. Please spread the word about this, blog it, Facebook it, Tweet it. Simon needs our support. 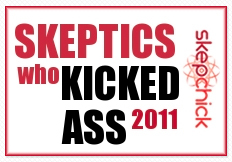 You can get the “Keep Libel Laws out of Science” button on your blog from Sense About Science. « Get a degree in seconds, free! » Come join us at Sydney sceptics in the pub, we have a ball!